ACL Staticide Aratron II Electronics, Inc.
SCS 10035 3"x5" Static Shielding Bag, Metal-In, SCC 1000 Series, 100/Pkg. 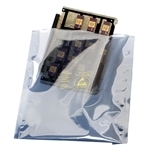 This transparent, metallized static shield bag provides a static safe environment for sensitive electronic devices. Four-layer construction. Polyester dielectric and metal layer provide Farady-effect shielding of ESD and fields. Tribocharging is minimized by the specially processed polyethylene. Flat and zipper closure styles.Coded for QC traceability. These bags are tested to meet or exceed certain electrical and physical requirements of ANSI/ESD S541, EIA 625, and to be ANSI/ESD S20.20 program compliant. The Transforming Technologies HG1360 Heel Grounder is constructed from durable materials and features a black stretch loop closure to maximize fit and comfort. HG1360 heel grounders connect the person wearing them to ground via a proper floor mat or flooring material. Wearing the conductive ribbon inside the shoe or sock assures proper electrical contact with the user. The ribbon connects to the conductive rubber to complete the circuit between the operator and the static controlled floor or mat. A buried 1 meg ohm resistor is standard. HG1360 heel grounders are worn on both feet to provide consistent grounding while in motion. The Transforming Technologies HG1360B Heel Grounder is constructed from durable materials and features a blue stretch loop closure to maximize fit and comfort. HG1360B heel grounders connect the person wearing them to ground via a proper floor mat or flooring material. Wearing the conductive ribbon inside the shoe or sock assures proper electrical contact with the user. The ribbon connects to the conductive rubber to complete the circuit between the operator and the static controlled floor or mat. A buried 1 meg ohm resistor is standard. HG1360B heel grounders are worn on both feet to provide consistent grounding while in motion. The Transforming Technologies HG1360R Heel Grounder is constructed from durable materials and features a black stretch loop closure to maximize fit and comfort. HG1360R heel grounders connect the person wearing them to ground via a proper floor mat or flooring material. Wearing the conductive ribbon inside the shoe or sock assures proper electrical contact with the user. The ribbon connects to the conductive rubber to complete the circuit between the operator and the static controlled floor or mat. A buried 1 meg ohm resistor is standard. HG1360R heel grounders are worn on both feet to provide consistent grounding while in motion. The Transforming Technologies HG1370 Heel Grounder is constructed from durable materials and features a black stretch loop closure to maximize fit and comfort coupled with a high visability orange strap. HG1370 heel grounders connect the person wearing them to ground via a proper floor mat or flooring material. Wearing the conductive ribbon inside the shoe or sock assures proper electrical contact with the user. The ribbon connects to the conductive rubber to complete the circuit between the operator and the static controlled floor or mat. A buried 1 meg ohm resistor is standard. HG1370 heel grounders are worn on both feet to provide consistent grounding while in motion. SCS 10023 2"x3" Static Shielding Bag, Metal-In, SCC 1000 Series, 100/Pkg. SCS 10024 2"x4" Static Shielding Bag, Metal-In, SCC 1000 Series, 100/Pkg. SCS 10026 2"x6" Static Shielding Bag, Metal-In, SCC 1000 Series, 100/Pkg. SCS 10046 4"x6" Static Shielding Bag, Metal-In, SCC 1000 Series, 100/Pkg.